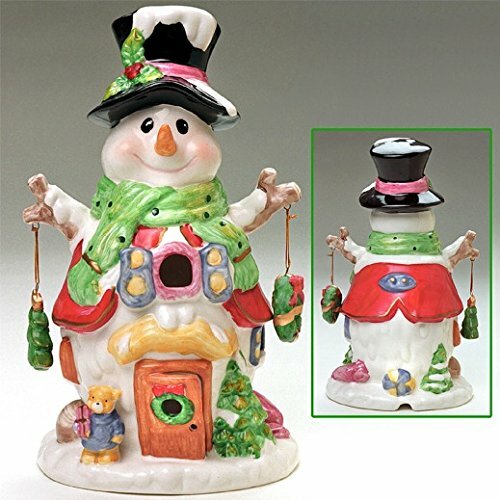 Ceramic 11" Electric Snowman Christmas Down Home - NEW Just in time for your Christmas decor, we've imported these beautiful 11" snowmen with electric lights to light up your Christmas shelf. Check out the detail on these Snowmen! Each SKU is different. See each hat is a different color. Each variation has different dangles and bongles and doo-dads hanging from it. Collect all 4 models! These beautiful ceramic figurines are UL rated with a 2 foot electric cord. Bulb is included. For indoor use only. SKU# 502005 - Maroon hat SKU# 502006 - Pink or Red hat SKU# 502007 - Black hat SKU# 502008 - Blue or Navy hat Free Shipping One snowman per sku number. Order all four TODAY! If you have any questions about this product by Designapirations, contact us by completing and submitting the form below. If you are looking for a specif part number, please include it with your message.